Club Penguin Cheats by Mimo777 Club Penguin Cheats by Mimo777: Club Penguin Herbert's Revenge Sneak Peek! Pretty cool i ghess.How did you get this. Sweet mimo! Im so getting this game. I cant wait 2 months! JK ill wait. I am going to get that game. On the other hand,whats that in herburts hand.Mabey a device. Mimo! The Orange puffle has been spotted at the ski village! I can give you a pic of it if you want. It comes down on the Ski Lift when you and a group of penguins turn orange and start dancing! Hope I could help! mimo you have to go to the ski lodge during the party. The orange puffle is on the ski lift. Go quick! omigosh omigosh omigosh! I am so gettin that! OMG THIS IS AWSOME!! i am defenentally getting this game!it looks like herbert GREW though dont-cha think? im gonna get it the day it comes out and i heard that in the uk they might have a midnight ralease. I know right? I cant wait to get it... I wonder if cp will make a new room cuz on the other ds game it came with a code that unlocked a room! I am soooo going to get it! Is it me or does Herbert look bigger? Yep, It is going to be great! wicked do know if our buck tooth puffle is in it. is the white puffle too. and im guessing the epf puffles are in it. cool! cant wait! ive finished first game its awsome I wonder what the unlockable thing is? another secret room? Sweet btw i dont have a DSI anymore but yaaa it looks cool! Defenetly! I'm going to buy this game as soon as it comes out! cool! I totally hope i can get it! I think the penguin on the front is orange because our little crazy friend is in the game! Sweet! I must have this game. Hope it comes Down Under! The new game is awsome. I can't wait till it comes out. i already have the first elite penguin force so im definetly getting this one! Hey, posted this some other places but... I need a sign out thing so just tell me if you come up with something. I will pick the best three then we can vote! Thank you. I appreciate it. How could cp get boring! how? Yeah it does look like Herbert grew. Yeah! i'm so gettin this game aswell! I have no clue! But Yayyay somehow got it to Mimo and now...well yeah! *Scratches head* I know you from somewhere...Uh, hello?! I am your buddy on CP?! Lol! You cn comment now? Sweet! I know! Thank you for the tip! I know! Purty sweet huh? First, Mimo can't meet you on CP unless you are a Mimo Mod...or Mega Mimo Mod or one of the Top Mods. Second, I don't know if he will mention your name on CPG. Sorry! Maybe? Maybe it will give us access to the Gadget Room that we have seen in so many missions! Well, you see, Mimo has this zebra named Rick, with white stripes and a black body, and he has super powers. Then when Mimo gives Rick a flipperful of gummi bears, all the work is automatically done. Helpful? Yeah didn't think so. I don't know! Actually he is chiseling the C in Clubpenguin. i guess he really hates us! lol. Maybe? What I think is that we will have access to the Gadget room! I think that there will be one of those unlockable codes like the EPF game. We will then have access to the Gadget room! Sorry long comment! What do you think? Probably not the second "theory" of mine but...? Aww that stinks. Just save up your money! I hope I don't eat it! Yuck! Probably, maybe it will be a secret island thats in the game! Haha, probably not... But im guessing there absolutly will be a new room, or some changes to the old one. Hope that helped a little! Yeah, either I was dreaming, or Mimo made a post about this, then it disappeared! Yes! You are right! Either he has eaten his fair share of donuts, or that is a close -up pic! We will see! Me too! I really cannot wait! Hmmm... that makes you think... **scratches imaginary beard..**** Maybe! Mine too! Remember only to put (ATB a CPG MOD) when you are modding! Thanks! Hey Mimo, Sorry I went skiing today, I'm going to answer a few questions then go to bed. I'll be back on my usual schedule tomorow. Thanks! Perhaps the game cover is on amazon? Awesome, right? I don't have any CP Merchandise besides a few books, but I heard the first game is great! sure this one will be to! Unfortunately Mimo can't do shoutouts or add people on clubpenguin, unless they point out a cheat that he didn't notice (and he decides to post) or if they are Mimo Mods/Mega Mimo Mods/ Top Mods. If he added/gave a shout out to everyone, he would spend so much time giving shout outs and adding people he wouldn't have time for his personal life. You can meet him and talk with him at his parties though. Check his twitter and this site for updates! This game looks like that herbert is going to steal more of G`s Plans! O yeah I will sure;y get this game for sure when june comes.! OOOH IM SO GETTING THAT!! Hey mimo notice how it says "revenge". Maybe that will mean in mission 11 we finally capture Herbert! or... we foil another plan. What you think? Mimo's a master! And he has so many fans that people can let him know when something new happens! I'm going to get that game! I hope they take all of the older regular missions and put them in the game so that some people who aren't spies will understand who Herbert is. I will get it too! Nice! I am seriously getting it when it comes out aswell. I think he has a contract with Santa Claus or with the Tooth Fairy. 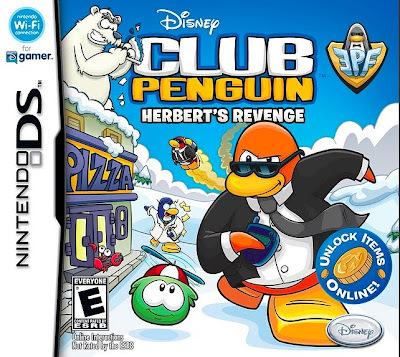 Yeah the game cover is better than the over one and it does look like Herbert is going to steal G's plans again. I always though people who have ipods should be able to have a clubpenguin app. That way they can take their penguin wherever whenever. Maybe. Either way I still think herbert wants revenge on us. afterall we have foiled like 3 of his plans :p Oh well, he won't get away with whatever he does next! Wow Herberts feeling a bit made in that title! But its gonna be really really good! I hope that they don't put the older missions in because everyone would be doing missions they've already done. And if people don't know who Herbert is they will probably find out in the game. The only thing I wish was that I don't have to get another DS game... BUT I'll still get it cause I LOVE EPF GAMES!!! An ATB CPG MOD is someone who is about to be a CPG MOD because they are at the bottom of the list on the right side of the blog where it says soon to be mods. You wont be able to get the orange puffle yet with that coin code because you bought that toy and the coin was made before the orange puffle existed. So the coin will unlock a treasure book without an orange puffle in it. But when the orange puffle comes out get the newest toy or a membership. Sorry for the long explanation. awesome, mimo! but how did u know about this? i am so might be getting this game. and i agree with anonymous about the white and orange puffles. u might be right anonymous, u might be right. anyway, thx again mimo u rock!!!!! omg!may 15 is my birthday!